For anyone who has visited a Genius Bar lately at an Apple store, you know it is always a good idea to pay careful attention to the tools they use. Leaning over the shoulder of a technician, you might spot Drive Genius 3, the latest version of Prosoft Engineering’s drive defrag and partitioning tool. A compliment to Data Rescue 3, Drive Genius is less about repair and more about diagnosis and defrag. You can scan a drive for sector problems caused when the platters of a drive do not place data correctly on a hard disk, which can then slow your computer. 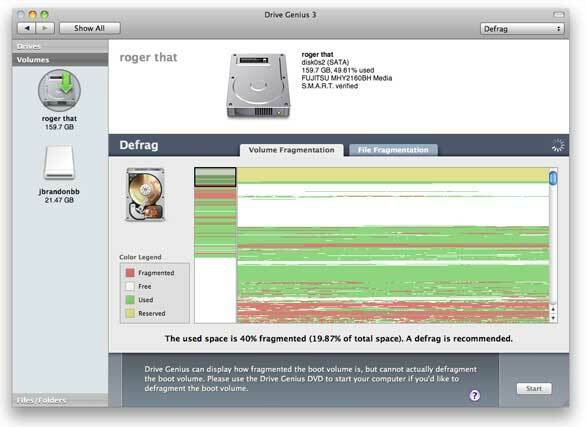 A suite of helpful tools helps you repair problems by running defrag (this does not restore lost data though) and partition drives so you can separate, say, a Mac OS drive from a data drive. A brand new tool called DrivePulse reports any errors that occur as you are using your Mac for everyday tasks. Drive Genius does not bother too much with superfluous graphics or fancy visuals, although the app does provide some nifty animations (similar to those in Data Rescue) that show how a hard drive platter might spin and bits flying across the screen during a scan. However, the options are arranged for quick access; you can click icons or choose tools from a drop-down menu. In several scanning tests with a normal drive in a MacBook that is about three years old, Drive Genius found a wide range of sector errors. One note about using this tool: to correct sector errors, you will need to use the DVD version, which allows you to access your boot drive. You can use the version that runs on your boot drive to find errors, however. Scans took about 40 minutes on a 160GB internal drive and about that same amount of time to defrag and fix problems. I noticed, after a thorough defrag, that my MacBook felt just a hair faster, especially for disk intensive tasks such as copying a file to a network drive and installing a large app like Photoshop CS5. I really liked some of the extra tools in Drive Genius. DriveSlim helped me find a boatload of large files (based on a criterion that finds files I have not touched in 30 days or more) plus old cached files and extra installers. DriveSlim shows you real-time info on the files it has found. Prosoft added a few extra features to Drive Genius to make it more compelling compared to competing defrag tools, including those that come with every Mac. (Note that the Mac does a better job of maintaining drive integrity just on its own compared to a PC.) Pesky sector problems do arise, and after several days or testing we never ran into a problem that the program could not resolve. The new features are not necessarily major, but do help in the diagnosis process. You can now verify a disk before running a defrag, a feature that is actually overdue for a tool like this. (Verification finds errors but does not fix them.) The program does not run faster than the previous release per se, but as a 64-bit program, it will run faster on systems with a lot of RAM because of how 64-bit software works. There is also more feedback about your drive (including details about bad sectors) than the previous release. There’s also one other cool addition: the program can send you an e-mail that you retrieve on, say, your iPhone after a long defrag process completes on a very large volume. This “scan and forget” feature is a step in the right direction. Combined with the new DrivePulse features that notifies you about errors as they occur, Drive Genius is becoming a bit more like a system admin tool for tech elites. I found Drive Rescue to me a bit more valuable to my daily Mac activities because it actually restored some files I had lost. Drive Genius repairs hard disk problems, but it can’t resuscitate a damaged file in the sense that you can recover the files and use them again. It fixes your drive. That’s why I ended up thinking Drive Genius is valuable, just not wholly indispensible.